David Robert Mitchell made a big impact in Cannes in 2014 with its It Follows, and you cannot accuse him of resting on his laurels and repeating himself: just as he switched from romantic comedy to horror between his first and second films, he now tackles the film noir genre. 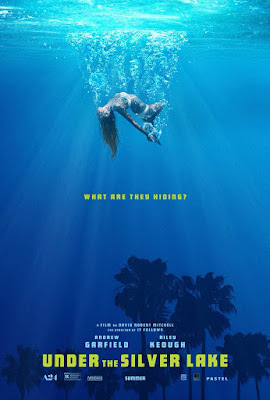 In Under The Silver Lake, Sam (Andrew Garfield), a thirty-something in L.A., meets an enigmatic and kooky new neighbour, Sarah (Riley Keough), with whom he shares a few hours of burgeoning connection and flirtation, only for her to vanish the very next day, having emptied her flat overnight. Suspecting foul play, he embarks on his own investigation in the city of angels, filled with conspiracies, mysteries and odd characters. The film begins as a film noir indeed, and uses many of the timeless tropes of the genre: a mysterious femme fatale who promptly disappears, conspiracies, some rich people doing weird things, a anti-hero, and an plot threatening to become more and more cryptic as it goes along. The director also enriches it with some 70's noir elements, such as a weird Californian cult. Except that this is not the most interesting aspect of the film, or even what it is actually about. While the direction is often impressive, with his very cinematic portrayal of Los Angeles (and some great night shots, one that directly references It Follows), the genre elements are not as accomplished as one might have hoped, and the mysterious atmosphere only intermittently delivering the goods. PTA did it so much better recently with Inherent Vice. While keeping the audience interested, the "mystery" is not particularly rewarding (which is somehow kind of the point), and the story rather straight-forward after all, for all its early promises of twists. The shadow of Mulholland Drive forever looms over any new neo-noir films, and the director gamely includes a couple of Lynchian nods, with a party featuring a Julee Cruise like singer, and a pivotal cameo by an actor who played in one of the most iconic scenes of the aforementioned masterpiece. In terms of references, classics have a more prominent influence however, with a wonderfully retro noir score in particular. David Robert Mitchell is more interested in the portrayal of the millennial generation, and is not kind with them! Thankfully there are no tacky "now" signifiers, nobody Instagrams their presence at swanky parties or talks in hashtags. Rather, Sam epitomises that very contemporary variation of narcissism, one that is not born out of vanity but out of entitlement, one that makes him believe he is somehow special and deserving. He is seemingly unwilling to work, despite his increasingly dire financial situation, being on the brink of eviction due to the non-payment of rent (he is given five days to find the funds by his landlord and does absolutely nothing about it the entire time), then having his car towed away by a debt collector. Not once do we understand what he does or rather, what he should be doing if he was working, and upon being asked repeatedly by various characters, he flakes out and mildly protests. So when this mystery materialises in his life, he sees it as an opportunity to add some meaning to his life and be part of something greater than his mundane daily routine. In a smart touch of characterisation, Sam is not portrayed as a loner, an oddball or, heaven forbid, an incel. 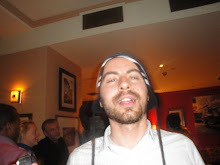 Good looking, and well connected, he has friends, has no problem gaining access to hip parties and approaching women, and has a casual lover on the side, making his lack of effort and success even more unforgivable. Just before you can say "adorkable" however, he is also prone to some mood swings and even acts of petty violence when things do not go his way. As Sam, Andrew Garfield delivers a savagely unflattering performance, never afraid to be ridiculed or even humiliated on screen, and shunning any kind of sympathy, with a deeply flawed character, finding just the right kind of balance however so that the audience is still willing to follow him on his quest. This is not the kind of parts that wins awards sadly, lacking the kind of of shouty acting and OTT histrionic that are usually favoured, but I hope the jury is bold enough to reward him this year, especially considering the relative lack of any real contenders in the best actor race this year. David Robert Mitchell also includes a commentary on the immaturity and pointlessness of nostalgia for pop culture (the film is littered with Nintendo artefacts), while making it very clear this is not a trait specific to this generation: in a surreal scene, any successive claims of rebellion and fight against the system that young people have made over the years are exposed as manufactured posing, engineered by "The Man". While conspiracy theorists/crackpots have always existed, the internet has unleashed a flood of opportunities for young people to try to unearth the slightest hint of hidden significance in any modern cultural, and Sam is seen desperately and angrily looking for some underlying meanings and clues all around him when there might be none. The director punctuates the film with a ferocious final scene, in which Sam's unwillingness to grow up goes full circle. 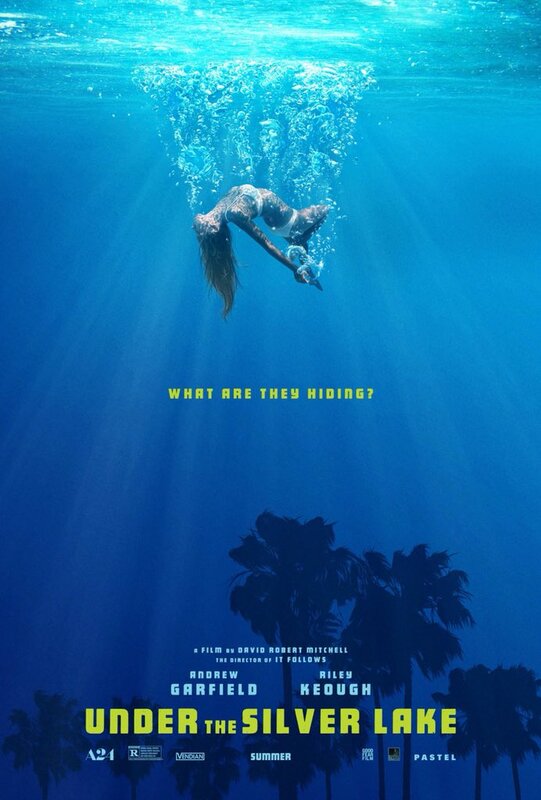 As a neo-noir, Under The Silver Lake is a disappointment. As a social commentary, the films gives us a lot to ponder over.